The level of ignorance about EHE being a perfectly legitimate means of educating one’s children is astonishing. Sometimes this prevailing unawareness or prejudice rears its head in funny places. Sometimes you detect it by what isn’t said as well as in what you hear or read. It can seem as if there’s a conspiracy of silence, or make you feel as if you’re under invisible surveillance. 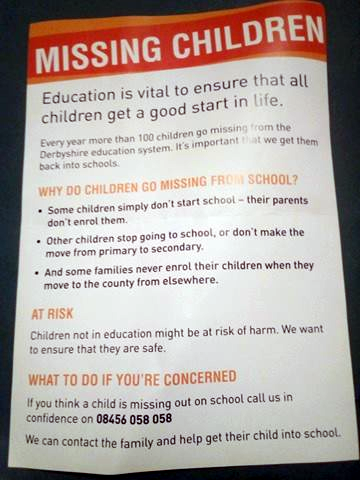 As part of their campaign to identify Children Missing Education (CME), authorities in Derbyshire thought it worth appealing to the majority belief that school is the place where children should be – as evidenced by this notice spotted by a HE parent. The Council’s CME Policy makes it clear that home education does not render a child “Missing from Education”. 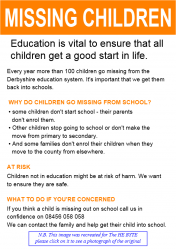 It reads “A child missing from education is a child or young person of compulsory school age who is not on a school roll and who is not receiving a suitable education otherwise, for example, educated at home, privately or in alternative provision.”. None of this features on the notice however, so by what it didn’t say, it unwittingly or otherwise confirmed the impression in the minds of the general public that home education is a dubious activity. It was disappointing to note that potentially genuine reasons for children to be out of school were not even thought of or mentioned as a possible line of enquiry – and not exactly the best way to improve neighbour relations either. The first thing to come to terms with is that the playing field is nowhere near level, and that the EHE parents are playing uphill all the time. We also have to adjust continually to new and unpredictable factors which alter the playing conditions. Most of these are outside our control, such as the recent conflation of off-rolling with EHE. The almost universal mindset that you have to attend school to get educated is another thing which makes our lives harder, along with the all too frequent attitude amongst local authorities that home educating families are in greater need of oversight than the families of schooled children. Sometimes we may feel it appropriate to set the record straight, responding in some way to what has been said or written in order to correct an inaccurate impression which has been conveyed to the general public. There may be times when such material gets to us personally, and causes us to feel inadequate, angry or apprehensive. Know your facts, know where you stand. Stay mentally and emotionally strong. Forge connections with other HE families locally, look out for one another. Don’t let yourself slip into fear or retreat mentality. Live your life freely as a home educator. Stand your ground firmly but graciously, remembering that each of us is perceived as representative of the whole HE community whether we like it or not. Opportunities may arise for conversations with people we know where we can speak positively about EHE and educate people about its many advantages. This too will give some push-back to the negative impressions built up through sensationalised or critical media reports. Maybe we could bring encouragement to a parent who has ended up home educating due to lack of other options. Although we may still feel like novices ourselves, a listening ear or the recommendation of a resource you’ve found helpful can be a lifeline to another HE parent. Make a start on your response to the government Call for Evidence trying to give reasoned answers (not a rant), and citing instances of local authority personnel overstepping their remit if you know of any. On 22 June 2018, we were contacted by Rob James of Derbyshire County Council advising us that the notice featured in this article “was withdrawn from circulation by Derbyshire County Council in 2011.” He added, “To suggest that it is still being issued by the council is misleading.” We have added this note at his request. We have also pointed out to him that our attention was drawn to the leaflet by a Facebook post on 25 May, with the poster saying that they had found “these leaflets in a public area of a council building.” This suggests they had been seen not long before the post was sent. We hope Mr James will be able to assure us very soon that a sweep of all council buildings has been made, and the offending leaflets removed from display and recycled. If you know where they can be found, please let us know and we will pass on the information.